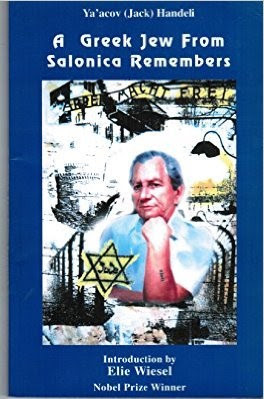 "A GREEK JEW FROM SALONICA REMEMBERS"
Originally published in Hebrew as "From the White Tower to the Gates of Auschwitz" by "Korot" Publishing House, Jerusalem, 1992. Following the title page of this book is a map titled "Two Thousand Years of Jewish Life In Europe". The age, by 1939, of the Jewish communities of Europe -- It shows Greece as having the oldest population in Europe - 2,239 years of Jewish communities existing in Greece. Much has been written about the catastrophe that had been visited upon European Jewry, yet little about how it affected the Jews of Greece. Too little. Jackie Handeli is to be commended for filling the void. Reading this book has moved me deeply, I felt as if I knew his grandfather, and could see his brothers walking down my block, in my mind's eye. His home town reminded me of my own. We also had non-Jews who did not work on Saturday. Jackie's style of writing is a reflection of his quiet, unassuming personality. He does not sound stringent or self-important. Herein lies the force of his expression. It is not possible to read his reminiscences without feeling kinship with him and liking him. One wants to get closer to him. It is only in the past few years that Jackie has devoted himself to what many still feel is a calling, a religious vocation: to recall things forgotten. Few can describe the events of those by gone nights as he can. He is often asked to accompany youth groups to extermination sites, or tourists who need a rather special kind of guide. Those who meet him become his friends.